Chennai: Indian Institute of Technology Madras has launched a Portal exclusively to showcase the profile of its’ Research Scholars and their cutting-edge research underway in the campus. The objective is to further national and international Research Collaboration and help recruiters tap the right candidates for top-level R&D positions and internships. The research portal (https://scholars.iitm.ac.in/) is in public domain and is open for access to everyone. It allows general viewers to view only the basic information of the scholars without any registration. The portal was launched during the Sixth Edition of Research Scholars’ Day (RSD) celebrations, held from 9th to 16th April 2018 to showcase the Research activities on campus. The Portal is aimed at providing information about Research Scholars from all departments of IIT Madras who are likely to graduate next year. It is divided into categories such as biography, Research Information, Publications, Teaching Assistant and, extracurricular activity. It has a search tab on the home page where one can search through fields such as name, roll, keywords, department and area of research. The portal currently has information on 130 students who are likely to graduate this year. Soon, the portal is likely to extend to all the scholars who have crossed Second Year in M.S. and Fourth Year in Ph.D.
RSD also collaborated with International Relations cell, IIT Madras, for an International fair to promote exchange programs, Joint Doctoral Degree Program, Joint Supervision Program. KLA Tencor, NOKIA and Perkin Elmer are the companies visited us during RSD for Research connect activities. 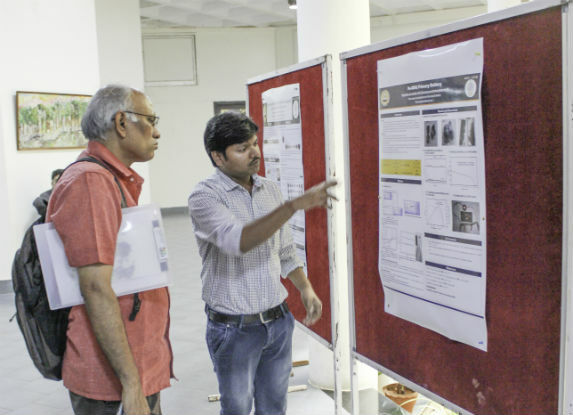 As part of the RSD Celebrations, several events were held that offered glimpses of the research underway at IIT Madras including, a Product expo, which was a platform to the research park companies to showcase their research product, an event for presenting posters by scholar besides an event for scholars to explain research in three minutes in non-technical terms. Padmabhushan awardee Dr. T. Ramasami, Former Secretary, Department of Science and Technology, Government of India, was the chief guest of the inaugural function. Started as a one-Day event in 2012, ‘Research Scholars Day’ has grown over the years to a week-long celebration. RSD 2018 had eminent personalities from various walks of life delivering lectures including Prof Jitendranath Goswami, Chairman, Advisory Board Chandrayaan-2, Ms. Tanuja Ganu, Cofounder and CTO Dataglen and MIT Technological Review awardee for Innovation under 35 years, Dr.Abhas mitra, Honorary professor HBNI, Prof. Ashok Jhunjhunwala, Principal Advisor to the Ministry of Railways.